I am increasingly fascinated by two words I think are vital to our future, but which I see declining in the world around us, “what if?” Navigating a way to a safe, nurturing and liveable future requires our coming together to create What If spaces, places and events where we can come together with others to ask those questions. The Transition movement, for me, has always been one of those spaces, the invitation for people to join up with others to look at their place through what if lenses. 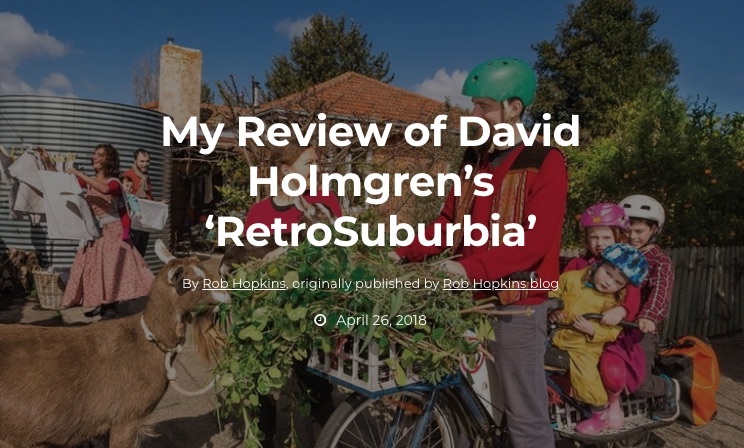 David Holmgren’s new book is a fascinating, and intoxicating blast of ‘what if?’ which ought to be put through every suburban letterbox in the world, although given its size I have doubts that it would fit. I am a huge Holmgren fan. ‘Permaculture: principles and pathways beyond sustainability’ changed my life. The ‘what if?’ at the heart of RetroSuburbia is “what if our suburbs were reimagined and repurposed to be sustainable, productive and vibrant?” Good question. It takes his ‘permaculture flower’ at its basis, as the lens through which it looks at the possibilities of how the suburbs could be if catalysed with imagination and possibility. Although written very much for the Australian context, there is much in its almost 600 pages to inspire suburban permaculturists anywhere. There’s a treasury of Holmgren insight on topics from retrofitting your house, harvesting water and storing food, to setting up a food garden, managing with less than perfect urban soils, working with animals in the suburbs and maximising diversity. You’ll find guidance on different models of living together, making decisions, creating a livelihood, reimagining your family finances, planning for disasters, ‘rearing self-reliant and resilient children’ and so much more. While ‘Permaculture’ was a book that had so many brilliant ideas it struggled sometimes to imagine that you might need some time and space, or some nice photos even, to be able to digest them, ‘Retrosuburbia’ is a different beast. Presented in full colour it is rich with photos, case studies from his own life and the lives of people he knows, every page drips with ideas, experience and advice with dirt beneath its nails. A couple of years ago, David and I debated publicly his ‘Crash on Demand’ paper, where he declared that “an argument can be mounted for putting effort into precipitating that crash, the crash of the financial system”. I disagreed, arguing that we needed to be very careful what we wish for. What I love about ‘Retrosuburbia’ is that the concerns that underpinned that paper are still present here, but beautifully couched in an utterly practical, utterly convincing vision for the suburbs. It is the perfect riposte to anyone who says “permaculturists/Transitioners/greenies just want to take us back”. Although that’s always a lazy and rather pointless accusation, this book shows a way forward in which human culture, in all its aspects, can flourish. This is my vision for the future. It’s beautiful, it’s delicious, and it’s entirely possible. You want ‘Take Back Control’? In these pages, you got it. This book will become the banner, the standard, around which people everywhere reimagine their future and then make it happen. And written on that banner? Two words. “What if”.